The landfall of supertyphoon Haiyan has led to a predictable upsurge in attempts by unscrupulous environmentalists to turn the drama into a political opportunity. For example, Jamie Henn of 350.org calls the storm a wake-up call for the upcoming UN climate summit. Simon Redfern in the Mirror says we should expect more such storms in future. There are plenty of others I could link to as well - there is, after all, no shortage of unscrupulous environmentalists - but I'm sure you get the drift. Remarkably, the two periods of most frequent typhoon strikes in Guangdong (AD 1660–1680, 1850–1880) coincide with two of the coldest and driest periods in northern and central China during the Little Ice Age. The phrase just got the Bishop's imprimatur. May it be used wisely. Andrew - thanks for finding this reference and demonstrating that real information trumps hype. However, we have a way to go - most of the MSM enviros are blindsided by the lazy opportunity to link storms to global warming. -3˚C here in Perthshire this morning, I think 5 days in a row with frost and I can't help but look forward to a long hard cold winter. But the reality is UK energy supplies could be sorely tested this winter and I am getting tired of watching the Captains of British industry cheerfully discussing the prospect of blackouts that are easily avoidable. Some of you readers may find this interesting. Presumably, as the typhoon is the result of global warming, then so is the quiet Atlantic hurricane season and one of the lowest seasonal tornado counts in the USA likewise the result of global warming. Or is that too logical for climate science? Remember the 'good old days ' of weather is not climate claims ? But, do these charlatans really believe the crap they spout? I doubt it. The 17th century also saw the most top end Hurricane landfalls in the USA as well. I've directly asked Chris Mooney several times that given Ryan Maue's graph of Accumulated Cyclone Energy, when is he going to write 'Calm World'? I've also had the fabulous experience of presenting Ryan's graph to a literary group discussing 'Storm World', moderated by a cloud modeler. I've also about half convinced myself that the Middle Kingdom has figured out that a warmer world is better for it, and that whatever man can contribute to that, will be most likely beneficial. They've got tree ring studies, too, ya know. In the same vein, we should remind ourselves daily of one of the most cynical, most parochial examples of such conduct, the eco-lobby-tinged western news coverage of the notorious incident at Fukushima caused by the March 2011 Tōhoku tsunami. Instantly labelled a nuclear disaster despite there being no fatalities, in terms of media coverage the incident came quickly to dominate the real tragedy, the extensive devastation and 19,000-odd fatalities in NE Japan. The stoic courage of the Japanese was in stark contrast to the hysterical outbursts of various green activists that there just might possibly be some nuclear fallout over Europe or even, so help us, the UK. That campaign more than any other finally convinced me that the environmental lobby really is beyond redemption. A raft of minor incidents in the plant clean-up programme has since been reported world-wide in frenzied terms. Fair enough, it's news of a sort. But when did you last read or see MSM coverage of how the region is recovering or of, say, the longer-term cost of the tragedy on the lives of millions of ordinary people? @ DaveB, I'll have a post on this next week. Japan has indeed shut down all its nuclear power and has consequently sucked in virtually all of the LNG cargoes that would have been heading for the UK. Nat gas prices in Japan are about 7 times higher than the USA!!! Importing all this expensive LNG has sent Japan's trade balance into the red with unpredictable outcomes for that debt laden economy. Most famous typhoons in history? 1274 and 1281 when two attempted invasions of Japan by Kublai Khan were thwarted when the invasion fleets were destroyed by typhoons. I've often wondered why for the second attempt wasn't made at a different time of year. 1284 was probably the most influential natural event in the history of Japan. Despite institutional denial inside and outside the scientific community regarding the ecological science of human population dynamics, The AWAREness Campaign on The Human Population was founded in 2001. Since that moment I have seen it as a moral imperative to continue the work I’ve been doing for many years now: getting the message out and explaining to as many people as possible that human overpopulation of the Earth is occurring on our watch, that it poses profound existential risks for future human well being, life as we know it and environmental health, and that robust action is required starting here, starting now to honestly acknowledge, humanely address and eventually overcome. I'll have a post on this next week. If you take your 'moral' imperative seriously, feel free to take your own advice. Meanwhile take your misanthropic filth elsewhere. I think Steven Earl Salmony should have watched Hans Rosling "This World: Don't Panic - The Truth About Population" on BBC2 on 7th November. @DaveB - check out my comment above, 4 from top of thread. - I should claim the term DramaGreen; inspired by Laframboise's Drama Queen Files where she points out for greens it's all about PR so they try to control the whole debate shouting & stamping their feet & drama queening about everything. So I coined "dramagreens". It's convenient shorthand & appropriate for use on blogs as it's accurate and not defamatory, so use it as you wish. It was inevitable, wasn't it..? Typhoon Haiyan. Mother Nature's trick to hide the decline in tropical storms. CNN in the US was for 24 hours hyping this up as a storm with "235 mile/hour winds". The forecast was actually for 235 km/hour winds. The fact that CNN does not understand the difference speaks volumes about the depth of their meteorological reporting, which is excruciating at the best of times. As usual I'll display my undoubted ignorance and ask someone to explain something I am failing to understand. As tropical cyclones are a result of nature trying to redistribute the Earth's energy budget, and as global warming theory talks about "polar amplification" will result in the poles warming more than the tropics, hence reducing the imbalance in the energy budget, can anyone tell me why that would cause more/stronger tropical cyclones? The entire population of the earth could each be given ¼-acre of land in Australia and still have a bit of Tasmania left over. That gives you all the other continents on the planet for everything else you need a planet for. Please explain how this amounts to over-population except in the heated imaginations of eugenicists and other opponents of humanity. Will you stop asking embarrassing questions, please. You really are becoming a nuisance .... I'm pleased to say. What will happen is that every alarmist theory about the world will need to get played out three times and then no one one will believe them anymore. Watch as the public learn.. There are already many domestic ones, you know, that are close to home and are seen to be lies and are now laughed at every time they are alarmisticly reported. I can confirm that stewgreen owns the copyright to the term 'dramagreen'. Try reading something other than population scare stories. Paul Ehrlich does not have a brilliant track record when it comes to predicting the future. - I coined a new one yesterday "Trough Economy"
Al Jazeera English announced (to those in NZ) that supertyphoon Haiyan was the greatest storm 'evah'. Being all seeing and all knowing has advantages. Would examining Chinese, Indian , Korean and Japanese records provide information on past climates? "Drama greens" yes, I love it too! Is that the first usage? Won't be the last. The new term for 'alarmists'. the paper the Bishop linked to mentioned the typhoons in colder and drier ages, I imagine that the theory has problems....It might even be incoherent. Very entertaining, interesting and informative. Also his presentation skills are to be admired. Your Grace, would you trust someone in Australia with some admin privileges? It is depressing seeing this troll's absurd climate doom mongering graffiti remain on the board for hours on end. I recommend johanna for the job. For me, I can't wait to lay my hands on Charlie so I can tattoo Troll on his forehead. Death toll of Yolanda already more than 10.000 and still counting. 70-80% which was in the path of the super typhoon has been destroyed (Tacloban) we're only at the beginning to realize what really happened. People lost their family and their posessions, have no water or food. And here we are at Bishop Hill talking about f*cking "Drama Greens"?? Some more retrospect and respect to the Philippine people surely is in order. I am a sceptic myself but this (and in some other blogs) attitude is appalling. sHx - I suggested exactly the same thing in a recent email to the proprietor. The troll usually posts late pm/early am zulu, presumably deliberately, so that her droppings remain for eight hours or so before most in the UK surface whereas we down here see them almost immediately. Four hours is a long time on the internet. I am sure the cheerfulness of discovering a fresh phrase to denote those who make political capital out of disasters such as this typhoon would have been severely moderated had the death toll been known at the time. Take it easy. Hysterical Aussie media already claiming 10,000 dead. My guess would be that the shanty towns took the brunt of the storm. Sadly, they usually do. Greens would have us all glamping in Yurts - and that is to be resisted. In the past, folk wisdom imagined comets were an omen of disaster. There are four comets visible at the moment so maybe supertyphoon Haiyan is linked to them ? I don't think so but maybe the same sort of cherry picking confirmation bias is going on ? There is so much more man made stuff around that can be damaged. Is it possible to know if the storm itself was anymore intense than ones in past centuries ? Nobody here is disrespecting the people of the Phillipines. What some people are doing is seriously disrespecting those who use this disaster, as they used Katrina and Sandy, to push their global warming agenda when they knew perfectly well then as they know now that there is no connection between individual hurricane events and climate change. Even the phrase 'super typhoon' is intended to imply something in a special category which this storm may be. Or perhaps the damage is due to where and when and how it hit. See geronimo's post at 3.55pm yesterday, Kevin Lohse's post at 11.17am, and Alan Reed's reply to you at 8.12 this morning. This is a one-off. When the bank account is opened for the disaster relief fund I'm sure that some of those you are criticising will be making a donation. Proportionately more, I am prepared to bet, than the warmists who will be too busy wringing their hands, tearing the clothes, and shouting "Woe! Woe!" On Andrew Marr Dame Shirley Williams linked the Typhoon to Climate Change and reason why the Green Taxes should remain, so pay extra for your Energy and have less to give to Emergency Disaster funds. In Bangladesh in 1970 a typhoon killed about 1 million people causing George Harrison to arrange an aid concert in 1971. This is virtually what the MSM climate change debate has boiled down to: The happening of any storm - anywhere in the world, at any time - is all that it takes to embed supra-national, co2 climate treaties, political allegiances and sustainable development themes into media coverage globally. The link has already been established: bad weather is the result of nasty, greedy, business-as-usual, capitalist, right-of-centre bahaviours; the nice storm-free weather the good guys (planet-saving environmentalists, one-worlders, population controllers, communitarians, socialists and the vested-interest political elite) want us all to have, can be purchased for cheaper and with all the feel-goodery of a wander through Capability Brown's gardens. (Sorry, Roger). I think we can look forward to more. As honest as the day is long, there will be weather events with alarming, but unpredictable, regularity. And in each instance, the propagation of political and emissions reductions memes will surface. It will bubble up inexorably within the context of human suffering, and who in their right minds could argue against it? If you are against co2 policy you are pro human suffering. That's a rock and a hard place. The moral of the story is, if there's a storm... capitalists get a hammering! Its an interesting conversation about Drama Greens. 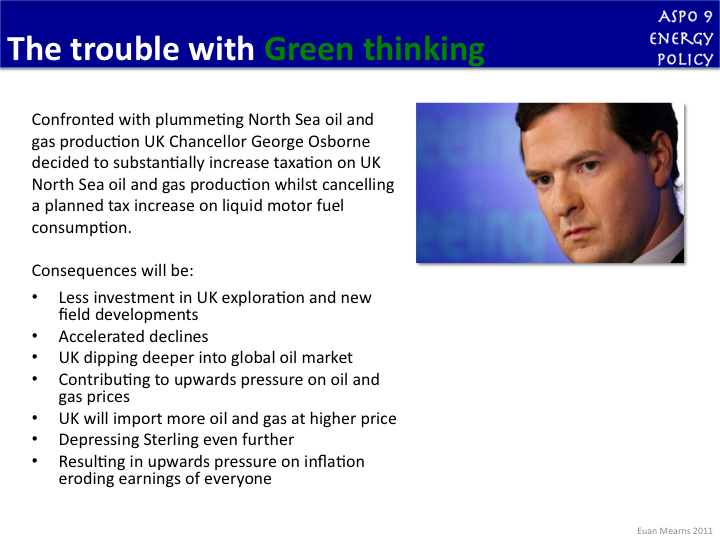 A few years ago I coined a phrase Wrong Thinking which I subsequently changed to Green Thinking which was found to be less offensive. In my mind this links to Double Speak from 1984 though there is no mention of double thinking in Orwell's book. An example of Green Thinking here. Green Thinking began, I think, in Vostok where applying the normal rules of logic one would conclude that atmospheric CO2 variation was linked to changes in temperature caused by Milankovitch Cycles. This became contorted into CO2 feedback amplifying the orbital effects even although there is absolutely no evidence this is the case. While projections under 21st century greenhouse warming indicate that it is likely that the global frequency of tropical cyclones will either decrease or remain essentially unchanged, concurrent with a likely increase in both global mean tropical cyclone maximum wind speed and rainfall rates, there is lower confidence in region-specific projections of frequency and intensity. Still, based on high-resolution modelling studies, the frequency of the most intense storms, which are associated with particularly extensive physical effects, will more likely than not increase substantially in some basins under projected 21st century warming. So basically, it's quite a complex story, more so than often portrayed in the media and by green campaigners, but the bottom line seems to be that there are grounds to expect the most damaging tropical cyclones to happen more often in a warmer world in the long term (several decades into the future) - but with the smaller warming that has happened so far, any expected changes in tropical cyclones can't yet be distinguished from natural ups and downs.